How to make smoothies such as a homemade fruit smoothie, green smoothies and more starts here. Once you know the basics of making different types of smoothies, you will soon be a smoothie expert. Smoothies are a wonderful, fast and nutritious way to drink raw. A homemade fruit smoothie is nothing more than a healthy shake. Fruit and vegetable smoothies are a great way to “drink” your veggies. Vegetable smoothie recipes can be easily converted into a raw soup. Here are the basics of how to make smoothies of all types. The beauty of smoothies is that they are good eating and you really cannot go wrong. All you have to do in order to know how to make smoothies is combine the food in the blender and then blend until smooth. Accurate measuring is not needed. Dairy smoothies made the concept of smoothies famous. These are considered the “traditional smoothies.” The combination of nut milk or yogurt and fruit mixed together in a delicious, drinkable form is a healthy (and raw) milk shake. If you know how to make smoothies in the traditional way, you have the basis to know how to make smoothies in every way. Here is how to make a raw, even vegan, traditional smoothie. Start with milk products such as nut milk or kefir. If you prefer vegan, then cashew or almond milk. Put 1 cup or more into your blender and add 1 cup of fresh or frozen fruit. Common examples are berries, bananas, mangoes, peaches, etc. Usually, the ratio for these types of smoothies are equal amounts of liquid and fruit. Add your favorite raw sweeter, maple syrup, raw honey, etc. Usually, 1 or 2 tablespoons of sweetener is enough. If you use liquid stevia, start with only a dropper full. A dash of cinnamon or nutmeg gives your smoothie a hit of added flavor and health benefits. 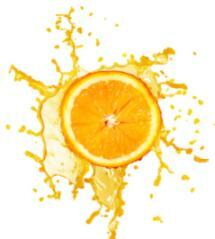 If you desire a colder and thicker smoothie, add a few ice cubes and then blend until smooth. 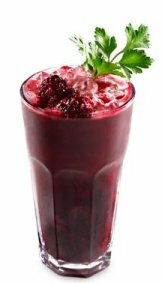 These smoothies use a majority of fruit, water to blend and ice cubes for body and cold temperature. 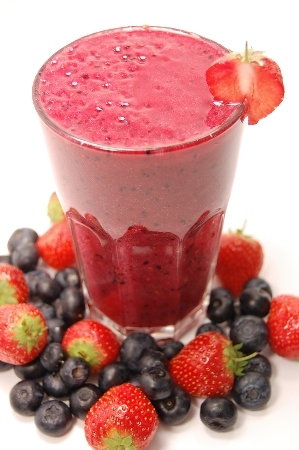 Fruit smoothies can be considered a blended, drinkable fruit shake. Or consider it a healthy version of a Freezie Pop! A homemade fruit smoothie makes a wonderful breakfast. For more information about whole fruit smoothies, see breakfast smoothie recipes. To make a homemade fruit smoothie you do not need to use any type of milk product. Fill your blender with fresh or frozen fruits such as berries, banana, pears, grapes, pineapple, mangoes, cherries— whatever you like. Then add just enough water or even raw, fresh, fruit juice and blend to the consistency you like. Add some ice cubes if you like a colder, thicker smoothie. Blend until smooth. 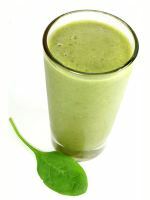 The green smoothie recipe was made famous by raw foodist Victoria Boutenko. I have further classified green smoothies into two types: Sweet Green Smoothies and Vegetable Smoothies. Sweet Green Smoothies are the most famous. A green smoothie is by definition a smoothie that is about ½ greens, usually leafy greens such as spinach, kale, cilantro, parsley, lettuce, etc. You can also add your wild harvested greens. The other ½ of the green smoothie is fruit. Add just enough water for blending and ice cubes if coldness and texture is desired. 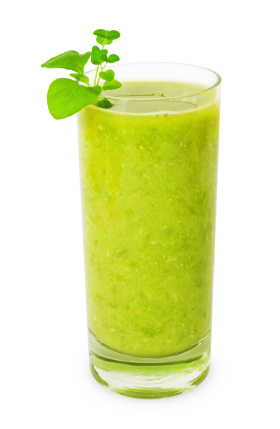 Green smoothies are a variation of fruit smoothies. Start your green smoothie recipe like you did your homemade fruit smoothie except add a handful of greens! Whala! You just made your first green smoothie. Don't force yourself by adding too much of the greens at first. Make your green smoothies more fruit and less greens and gradually increase the amount of greens that you add. The goal of green smoothies, at least at first, is NOT to taste the greens, just the fruit. Just a note of caution: Green smoothies are not always a beautiful, green color! Many times I have used a combination of strawberries (red) and greens (green) and the result is a mud-colored (brown) smoothie. Not pretty at all! But de-li-CIOUS! The beauty of green smoothies is that you are drinking nutrition. The action of blending breaks down the tough greens. This helps your body to start the digestion process quicker. It is much easier to gulp down a bunch of cilantro or kale leaves, than chew and enjoy the same amount of greens. Whenever you want something quick, very filling and nutritious, make a green smoothie. I have one every mid-morning. I even take my Vitamix blender with me on trips to ensure I always have given myself the gift of a green smoothie every day! Vegetable smoothies can be raw soups and/or blender meals. Many times they are tomato based. Since tomatoes are so juicy they make excellent smoothies. A general vegetable smoothie recipe consists of half tomatoes (either the juice itself or fresh tomatoes) and half greens. A basic tomato vegetable smoothie recipe, is simply to start with 1 or 2 cups of chopped tomatoes or fresh tomato juice, then add some greens. 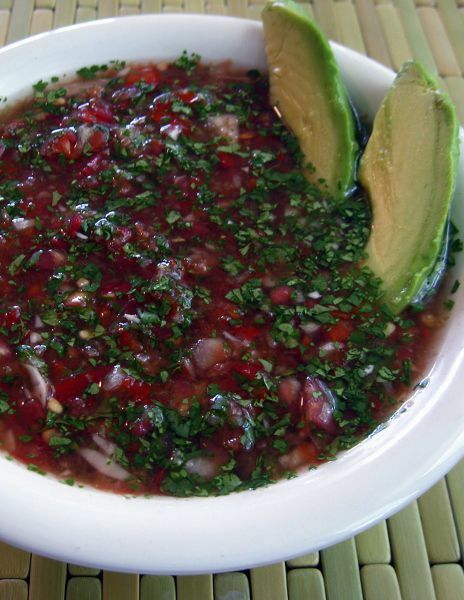 You can also add a small onion, a radish, carrot juice, a clove of garlic or any other soft vegetable. Sprinkle in some herbs for flavoring, such as basil, oregano, cayenne pepper or a dash of Italian seasoning. To turn your vegetable smoothie recipe into a raw soup, just make the vegetable smoothie but reduce the amount of greens, blend until smooth, pour into serving bowls and add fresh, raw vegetables such as corn, chopped avocado, grated carrots, pine nuts, etc. Here is a picture of one of the BEST blender meals or raw cold soups that could also be classified as a smoothie, it just depends how you serve and eat or drink it. Follow this recipe for Gazpacho Soup and you will know how to make smoothies and a great blender meal! Once you have all of your raw smoothie recipes together, just add them to a blender and blend at the highest speed until smooth. Many raw foodists recommend the excellent Vita- Mix and Blend-Tec blenders. In my experience, the more expensive high-powered blender worked better for me. I tried a less expensive brand that was touted to be a good smoothie maker and I found it did not blend dates, nuts, and the important greens into a smooth consistency. I had pieces and stopped using it as it wasn't appetizing. I highly recommend saving your money to get one of the best blenders. I have a girlfriend who found hers on ebay brand new, for about 75% of the original price. I bought mine about twenty years ago, and the engine still ROARS like brand new. 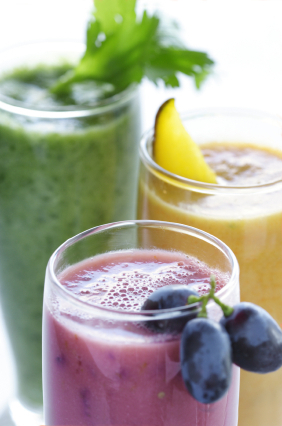 Figure out which smoothie you would like to make, add your ingredients and enjoy!